The “harp” switch stand was used in conjunction with stub type switches. This replica switch stand represents the standard style for the South Pacific Coast Railroad (SPCRR) during its existence from 1876 to 1887. The SPCRR started construction both north and south of Newark in 1875. It crossed the SP tracks in Santa Clara by the depot in 1876. The railroad was completed in 1880 and ran from Alameda Island to Santa Cruz. A copy of the original map depicting the SP/SPCRR crossing is displayed next to this switch stand. 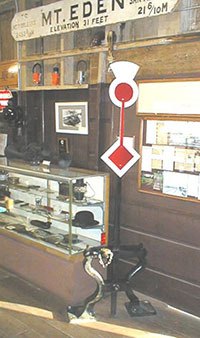 Additionally, pictures and paper memorabilia of the SPCRR in the Santa Clara Valley are also exhibited.